The architect of the 1880-1892 train station was A.L. Davis, who also designed the Hotel Weirs. 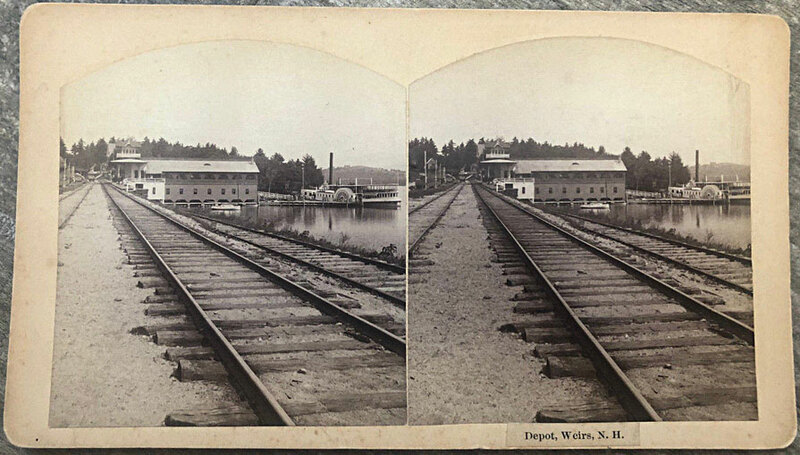 Here is a stereoview of Weirs Beach from the Kilburn Brothers, No. 761: “Depot and Boat Landing, (Weirs. 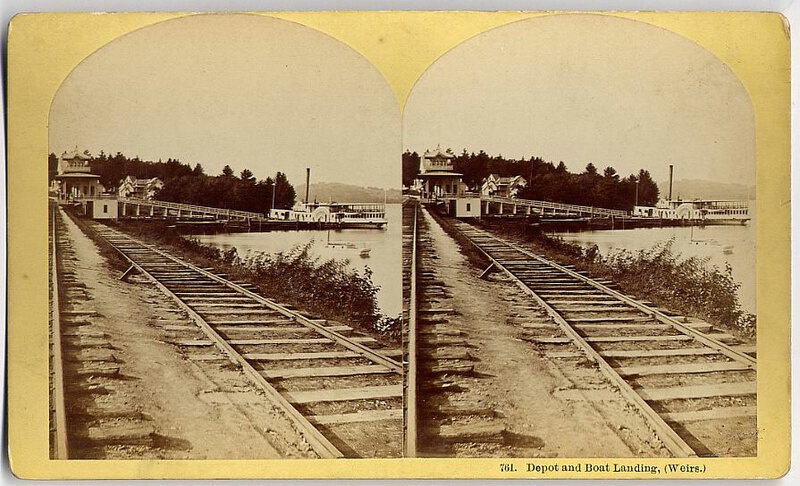 )” It is a “cabinet size” stereoview of the 2nd railroad station and the Lady of the Lake, early 1880’s, showing the cargo railroad spur that descended under the railroad station. This stereoview is taller than the normal stereoview. “In the late 1870’s, taller [stereoview] cards and images (often called cabinet size) became popular in the stereoscopic trade. The sales pitch was that they gave the customer a larger image to look at, but in practice the top part of the taller image could only be seen with great difficulty in the standard stereoviewer. This shortcoming soon became apparent to users and the format was abandoned in the late 1880s with a return to the conventional-sized stereoview. In any event, [Benjamin] Kilburn followed the trend for a relatively short period, roughly 1877 to 1883, issuing a substantial group in this format.” – T.K. Treadwell, from “The Photographic Images issued by the Kilburn Company”, published by the Institute for Photographic Research, Monograph Series, #5, Sixth Edition, January, 2002. 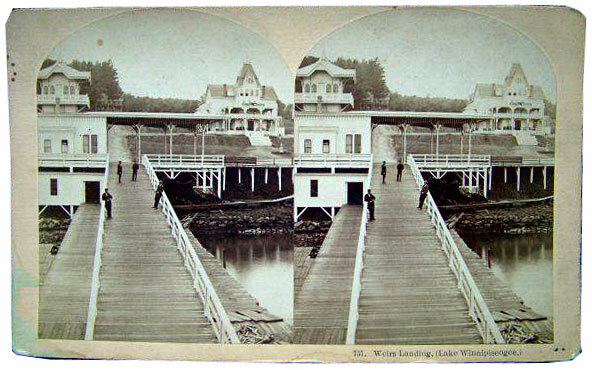 Below, a very similar stereoview to the above, after the Weirs Cafe had been added to station in 1885. Photographed by F.J. Moulton. 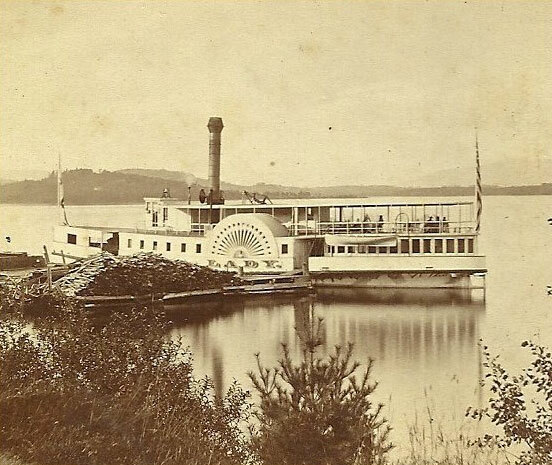 The rear of this stereoview is dated August 8, 1887. 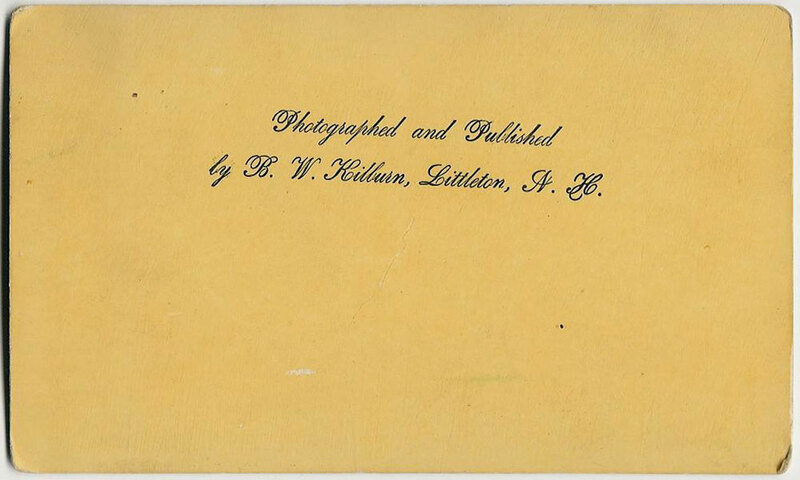 Kilburn stereoview #757, “Weirs Landing, (Lake Winnipiseogee. 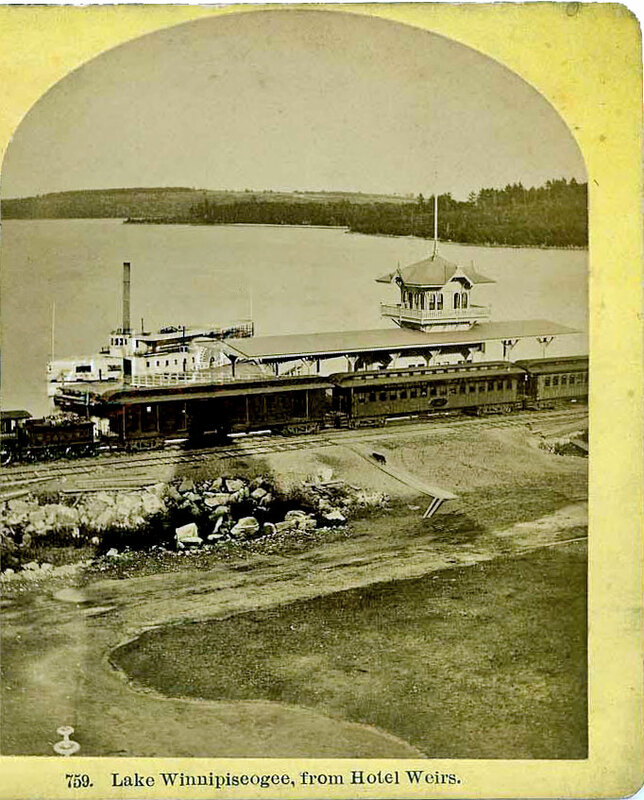 )”, also a cabinet size card, shows the ramp leading down from the 2nd train station to the Lady of the Lake wharf. 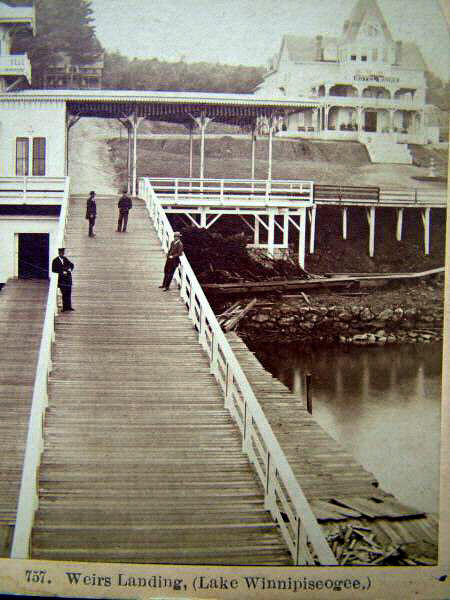 The original, unexpanded Hotel Weirs is seen in the background. 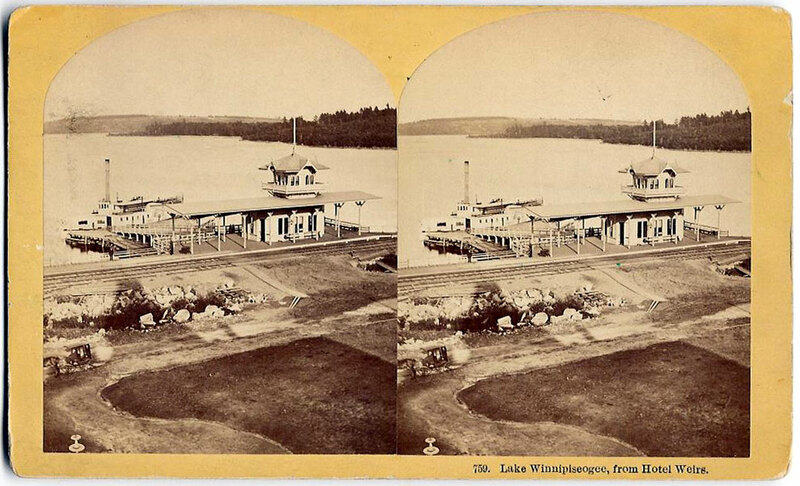 Kilburn stereoview #759, “Lake Winnipiseogee, from Hotel Weirs”, also a cabinet size card, shows the 2nd train station in its entirety and the Lady docked at her wharf. In the bottom left corner of the card a horse and carriage passes by; we also see part of a fountain on the lawn of the Hotel Weirs. The tall turret of the Hotel is casting a shadow which is seen just behind the horse and carriage. Another, alternate version of Kilburn stereoview #759 shows the passenger train ready to depart Weirs Station. Once again we see the turret of the Hotel Weirs casting its long shadow. Here’s a photo of the station and Lady taken by the Weirs Photograph Company (F.J. Moulton and T.C. Moon). 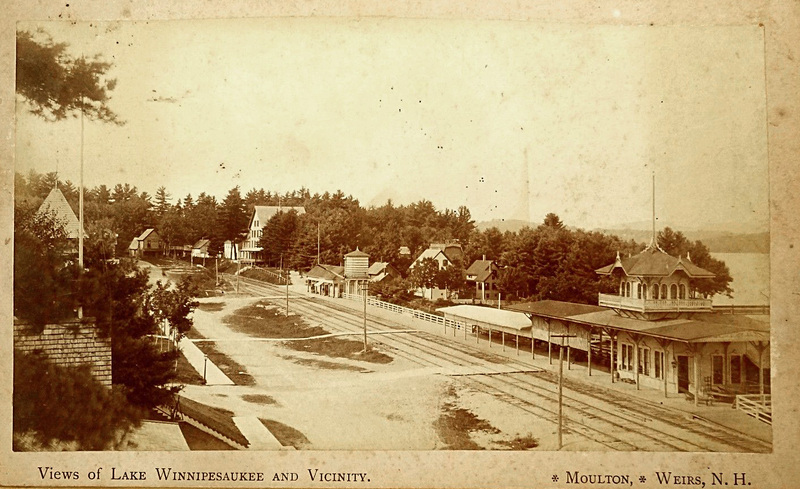 Here’s another Moulton photo, with a view of the street and boardwalk. Here’s a Moulton stereoview photo of what may be a veterans gathering opposite the second train station. Lakeside Avenue is just a wandering cart path at this time. 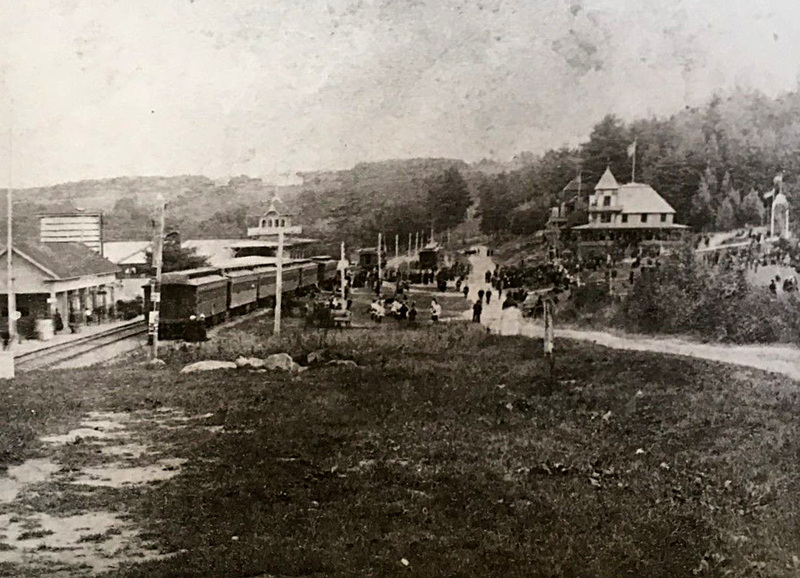 The Hotel Weirs cannot be seen on the right side of the photo, so this gives difficulty in dating the photo, since both the second train station and the Hotel Weirs are supposed to have been constructed in 1880. 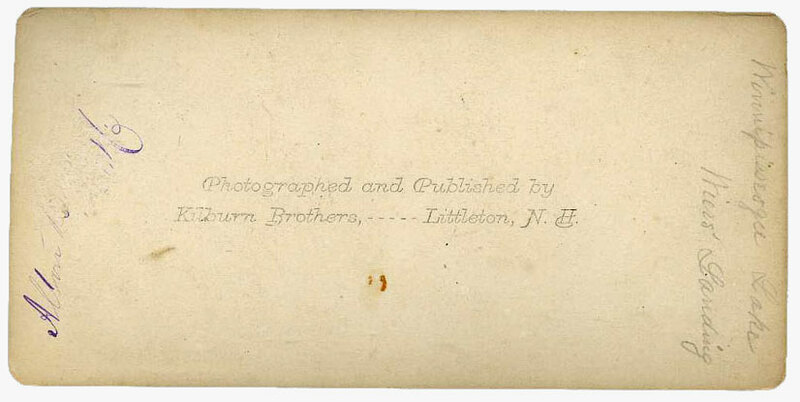 Another photo taken by the Weirs Photograph Company (F.J. Moulton and T.C. 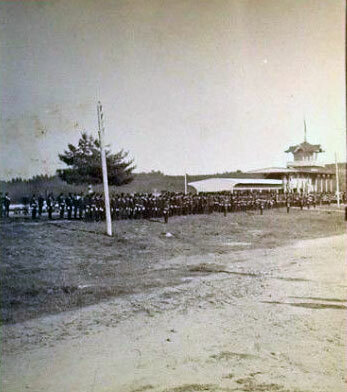 Moon) shows the station and a group of soldiers in formation. Here’s a view from the rooftop of the second station looking North. Photo taken by F.J. Moulton. 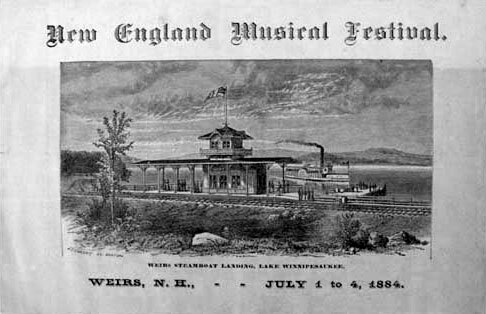 Here’s another engraving of the second train station, from the New England Music Festival, July 1-4, 1884. 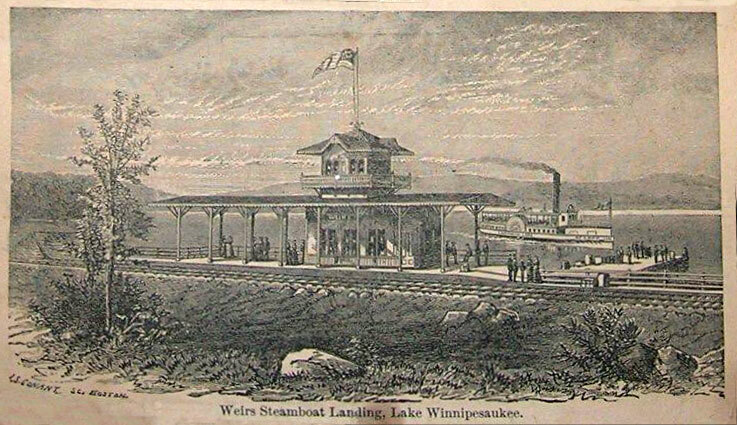 Here’s yet another engraving featuring the station. Unlike the above two engravings, the point of view is from the Lake. 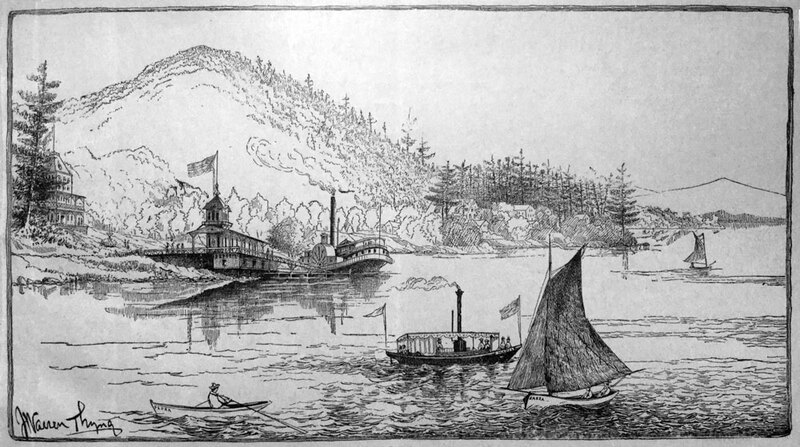 Also seen is the Lady of the Lake, and the Hotel Weirs (on the far left), with Brickyard Mountain looming over the entire scene. The engraving was drawn by J. Warren Thyng and appeared in his 1882 Lake-Country Sketches. Here is an earlier issue of the #353 card, perhaps the first issue. As can be seen on the reverse, the card dates to August of 1869. Kilburn stereoview #355, “Lake Winnipiseogee”, probably taken at the same time as #351 and #353 above, shows a stone wall, a field, and a sliver of the Lake. 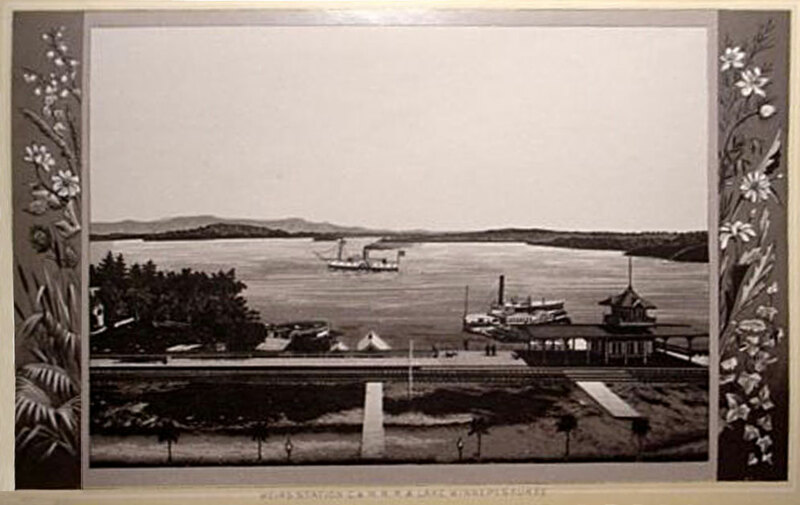 The photo was taken from the farm that 10 years later became the grounds of the Winnecoete hotel, and a hundred years later, the Village at Winnipesaukee condiminium development. 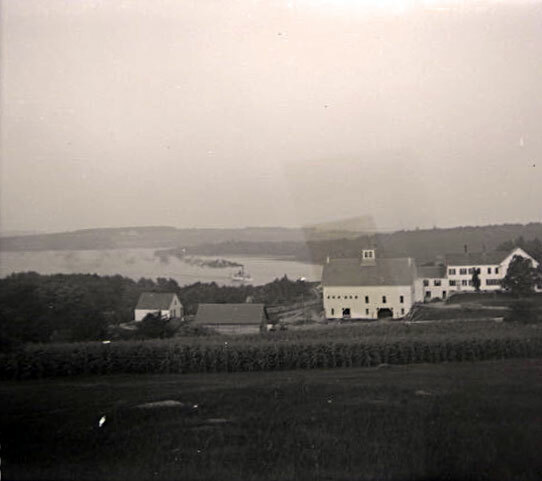 It shows, just beyond the farm houses, a tree-covered hill steeply sloping into Weirs Bay. 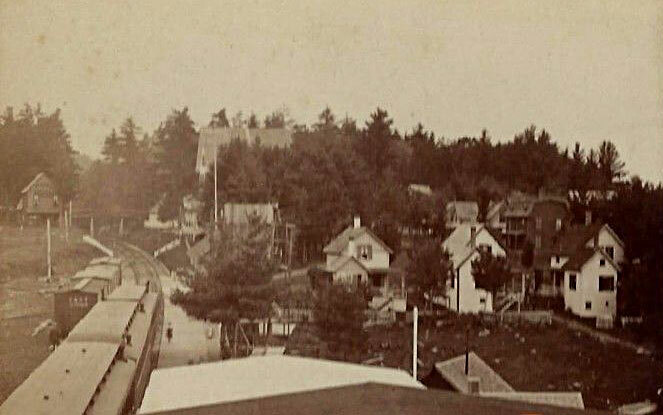 This was Tower Hill in 1869, just prior to when real development of Weirs Beach began. 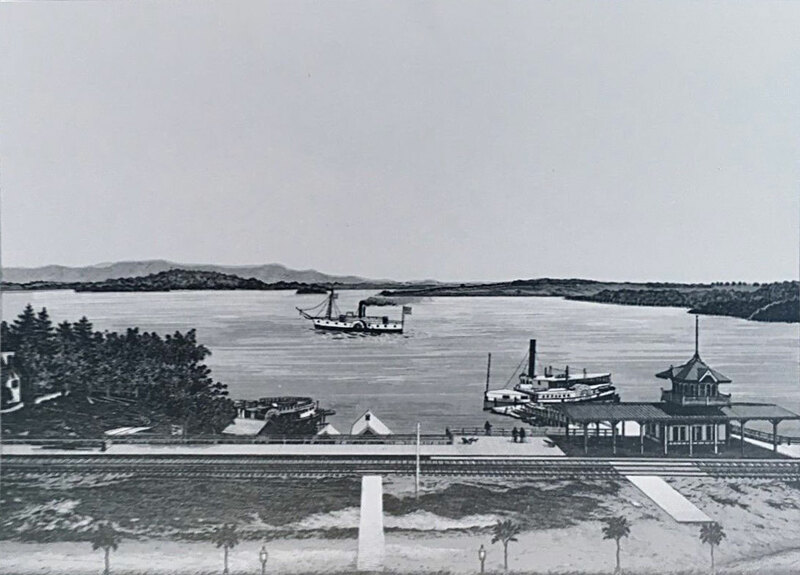 A somewhat similar view, taken about 40 years later, shows Lawrence Manor in the foreground, and the Mount Washington steamer in Weirs Bay. Here’s a postcard with a similar view to the above. Note the rare view of the New Hotel Weirs from the rear. Nearly all other views of the Hotel show its front side. 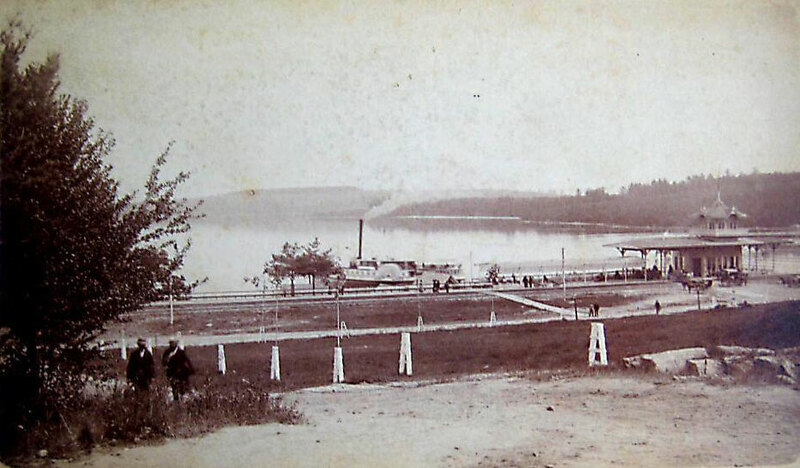 Also note Governors Island in the background of the postcard. 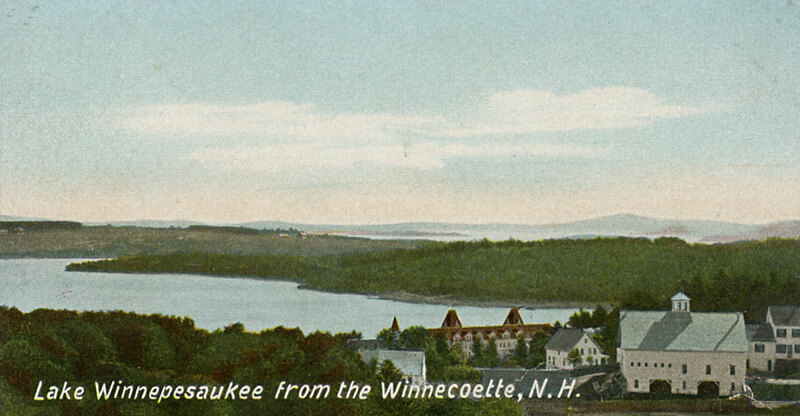 Currently the island is heavily forested (between the many expansive private homes), but at the time of this postcard, nearly the entire island was field and farm.